The SatNav cards on eBay, has anyone had any success with them recently ? What system are the 2015 M3's on, is it still TomTom ? Did you try one of these Bob? If not I have purchased 2 new cards for my recently purchased second hand 64 plate. One from eBay and one from a sat nav provider. I'll post when I've tried them to let you know. Mazda asking £150 for 3 yrs updates is a rip off considering my 8 yr old handheld Garmin comes with lifetime updates at £75! Ok dropped one of these in today and has worked no problem. Going to give it the inaugural 60-70 miles run in to get VIN register. Then I'll try it in the Mazda Toolbox app and see what happens with the free update offer. If all OK I'll post back. £30 for the SD online is a massive saving and if it works Mazda needs to really think again about how they look after their loyal client base more! Yeah can update as has now been in the vehicle for over 150 miles and the SD works fine. It has registered itself now with my vehicles VIN. I have used it with Mazda Toolbox and it is picked up no problem. It does say there are no updates but that is probably because it is March 2018 mapping. So as far as I'm concerned it has been worth every penny for the massive saving on Mazda own updates. That is great news.....eBay here I come....Do you have to leave it in the car for registering before using it in the Mazda toolbox software? I think it registers to the cars VIN number after a set number of miles, 70 I've read somewhere. Once registered it is recognised by Toolbox and can be backed up and then update I hope when a new map is available. Which SD card do I need to get for Nav? 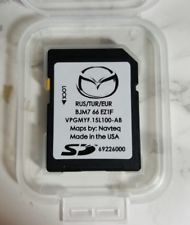 I purchased a Mazda 3 SE-L Nav 2014 on Monday but it didn't come with an SD card for the Nav despite being sold as coming with Sat Nav. Anyway, I've been told that I can buy them on ebay for £30-£40 (Mazda dealership quoted me £600) but I don't know which one I need to buy as apparently they need to be an exact match. If someone has experience with this please let me know. > Lukecurner...... I have merged your posting with an existing topic that answers your question. Read through this and it should help you. Perhaps Wishy14 can respond with a link to the e Bay card he bought, or specify the details. Not sure if this link is right guys the way I've inserted sorry but tried photo and link but photo wouldn't work even though only 123kb. Just bought this SD card for £32.99 for my 2015 Mazda 3 SE-L (no factory fitted SAT NAV) and pleased to say that it works. Many thanks to Wishy14 for the link. That's great faltwen1 glad to be of assistance. Enjoy the good value for money. I know how cheap these items are to produce and Mazda need to be more transparent with their over pricing really and they would benefit massively. I know it's not just Mazda however my 15 year old Garmin with lifetime map updates is still going strong!! but as you say it is now not available. Hopefully if you try searching e bay you might find the same thing under a different listing. Page created in 0.272 seconds with 35 queries.